Our artist of the week is Vincent Van Gogh. I didn't originally intend to use Van Gogh as a lesson for learning to express our emotions in class, but the opportunity presented itself, so I seized it. At The Gan we provide a frustrated/angry/sad child with options to express how they are feeling. They can show their feelings by stomping their feet, sitting in a chair/ standing in a spot of their choice until they feel calm. We encourage them to their words to tell us how they feel and why. We have a list of synonyms for sad and angry to help them best describe how they are feeling. I have been known to say: You can tell me you are mad at me. Mad is a feeling. You can say to me "I'm mad at you Morah Katie! Morah Katie you made me angry! ", I am still going to love you even when you are mad at me. If a child doesn't feel comfortable expressing their feelings these ways, we encourage them to express themselves through art. I invite children to draw how they feel. Often times they will take me up on the suggestion. Van Gogh's use of colors in his paintings provided a teaching moment. Emily: The black is very dark. Jade: It's a happy painting. Colette was feeling a little sad one morning. We began to talk about Van Gogh and his paintings. In our book about Van Gogh, it states that he used dark colors when he was painting something he thought was sad. When he was feeling his happiest he used his most vibrant colors. I asked Colette if she felt like painting what she was feeling. She said she did. Morah Katie: What colors do you think you will use to show how you feel? Colette: I think bright ones. Morah Katie: When I see bright colors I think happy, are you feeling happier now? Colette: I am, I'm not sure how to paint it. 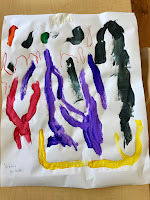 Morah Katie: I think choosing colors is a good place to start, and then I think you should paint what you think happy is. A young child can easily become overwhelmed by their "hurt". It can appear to consume them. In fact, the strength of the emotion affects how they think, and at times it prevents them from thinking. The limbic system, the structure in the brain that deals with emotions and responds to emotional stimuli, begins to take charge of their brain. 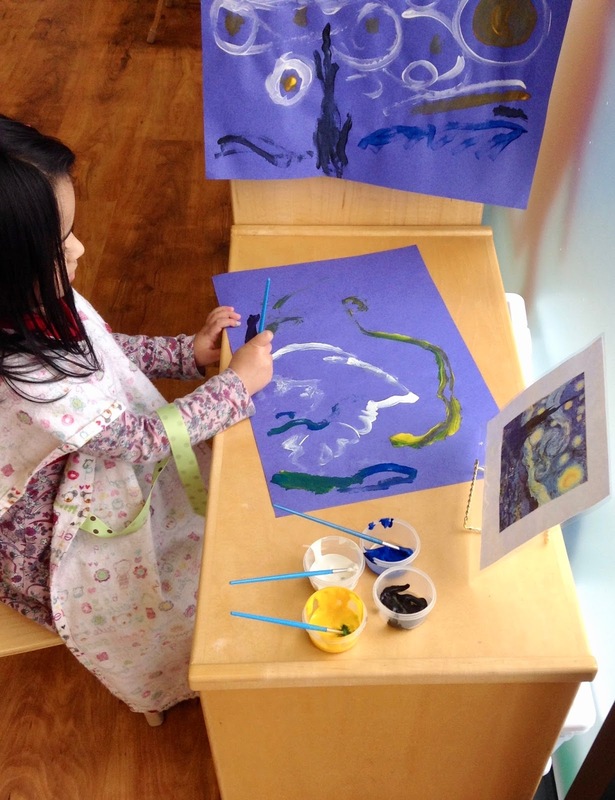 Painting can help a child unburden themselves of this and can help them begin to calm themselves. Matan became frustrated. He was very upset. He could not find a solution to his problem. I pointed out some of the new paintings we had in the classroom. He mentioned he had made an all white painting at home. Morah Katie: That sounds very interesting. I wonder what that looked like. Are you interested in making one here? We have white paint at the easel today? 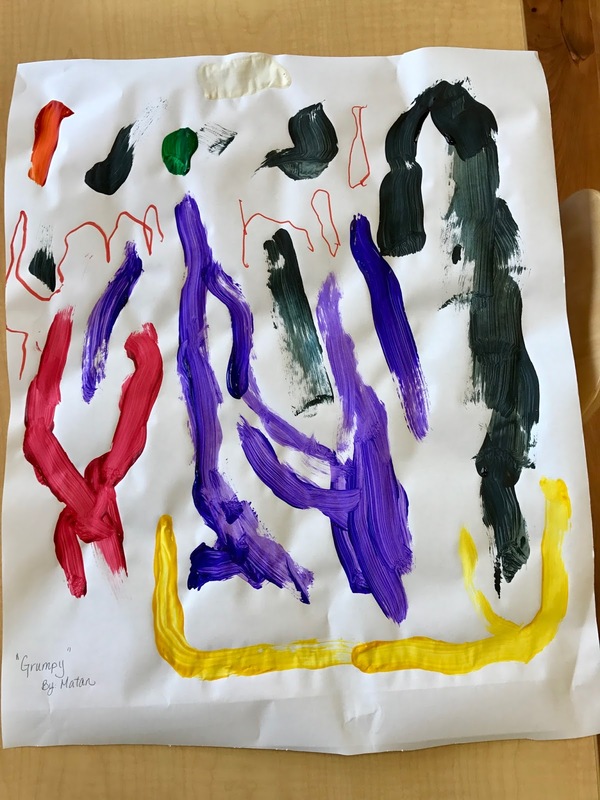 Once sitting down, Matan made some different color choices. Morah Katie: Oh I see you choose black and purple. Why? He continued to paint. I noticed a change on his face. Morah Katie: Are you still painting a grumpy painting, you have added other colors. Morah Katie: Now it's happy. Are you also feeling happier? Emotions give us valuable information about ourselves and what we care about. 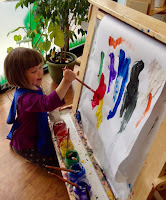 Positive and constructive expression of feelings, through art or with words, provide children with some empowerment in situations they may feel they have little control over. Often times once a child has had her/his feelings validated and acknowledged, they are ready to find positive solutions. Morah Katie: What do we know about Van Gogh? Olivia: He used dark colors for sad things. Jade: He used bright colors when he was happy. Lochlan: He used a lot of paint. So much it fell on his shoes. Mason: He would use so much he would run out of paint and have to buy more. Morah Katie: When you look at Van Gogh's Starry Night, how does it make you feel? Olivia: I feel happy. There are a lot of bright stars. Maya: I feel happy too. 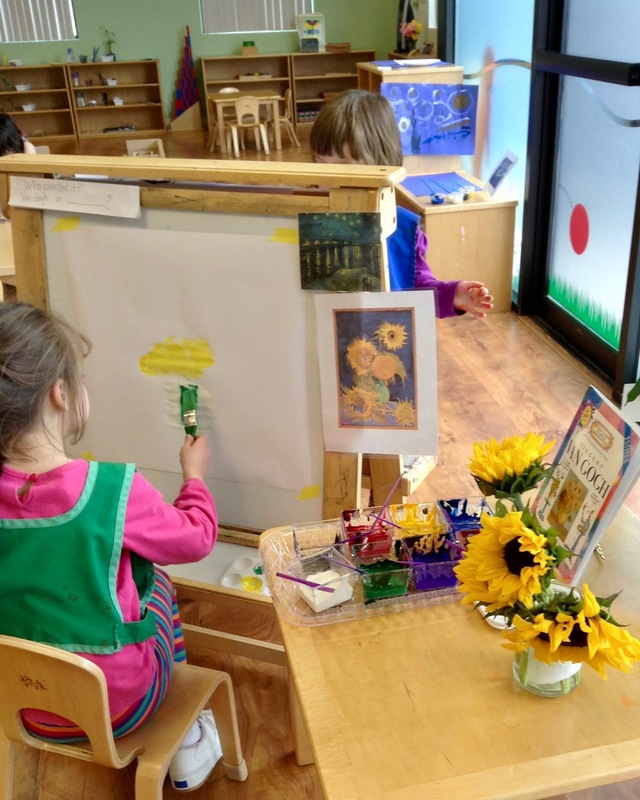 Morah Katie: When you look at sunflowers, what do you think of? Olivia: The Sun. HOT sunlight. Colette: I think of my mom because she loves yellow. Maya: I think of yellow. 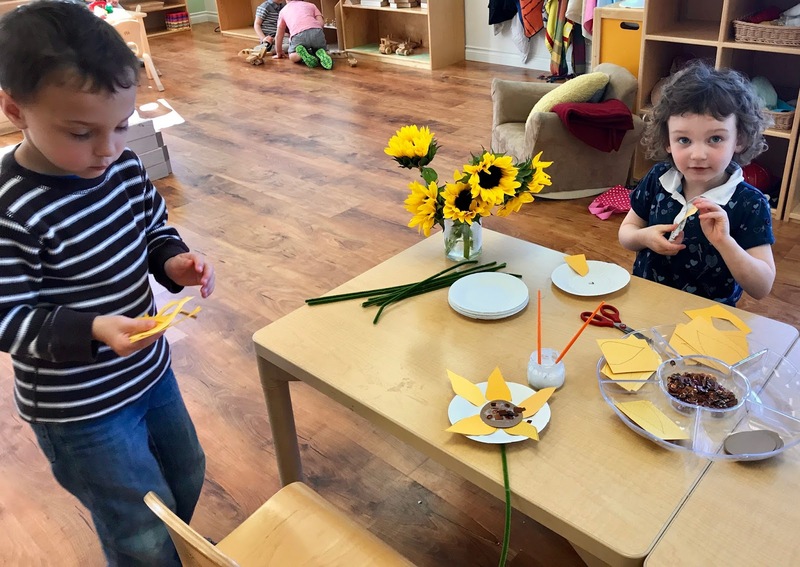 Morah Katie: How do sunflowers make you feel? Morah Katie: How do you think Van Gogh was feeling when he painted them? Olivia: It doesn't use any dark colors.